An inquiry is calling for fundamental changes to doctor training in the wake of the recruitment furore this year. The independent report focuses on how medics in the UK progress from junior doctors to consultants. Author Professor Sir John Tooke said the Modernising Medical Careers training system, introduced in 2005, did not provide broad-based experience. The Department of Health said there were lessons to be learned and it would consider the report. Under MMC, juniors could reach consultant level in an average of 11 years, rather than the current 14, by encouraging trainees to chose a specialty, such as surgery, earlier on in their career. But the Tooke report says this is unlikely to encourage or reward striving for excellence, or allow enough flexibility both for doctors and for the NHS's ever-changing workforce requirements. There are also concerns regarding the preparedness of someone certified as trained under the new system for the consultant role, it says. The report recommends doctors be given more years of broad experience training before following a specialist route. Doctors have campaigned hard against the revamped medical training system. In particular, they were angered by the flawed online application system (MTAS), which doctors say led to many excellent candidates not being offered jobs. The government in England has now confirmed that there will be no national IT system like MTAS next year and deaneries will be left to organise their own recruitment at a local level. There will also be staggered start days - this year all doctor contracts started on August 1. The Tooke report said the new system was "rushed and poorly communicated", but it added the problems were exacerbated by the high number of overseas applications - 10,000 of the 28,000 came from abroad. The government has responded to this by announcing a consultation will take place over whether UK graduates should be given some kind of priority. Sir John said: "This has been a sorry episode for British postgraduate medicine, which has caused great distress to many trainees and their senior colleagues. "From this experience we must learn, and put in place the mechanisms to ensure that in the interests of the health of our population excellence prevails." Dr Hamish Meldrum, chairman of the British Medical Association, said: "The report highlights the need for coherent medical advice on key matters of principle, and the importance of doctors being involved in the management of the health service - we couldn't agree more. "Failure to engage with doctors was an underlying reason for the disaster we saw this year." Lib Dem health spokesman Norman Lamb said: "Ministers must heed this stark warning and make changes immediately. "The system was doomed from the outset, with no piloting and flawed central direction." Shadow health secretary Andrew Lansley said: "This lays bare the shameful mismanagement by the government of junior doctors' training." Health Minister Ben Bradshaw said: "We will consider Sir John's findings carefully. "We have learned important lessons from the problems with this year's recruitment process for junior doctors. "Working with the medical profession, we need to ensure that future recruitment processes are soundly based and have the considered support of doctors and their representatives." The other devolved governments said they would be considering the Tooke report. 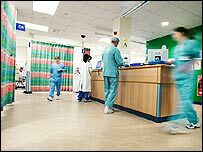 Scotland has not yet decided what it will be doing next year, while the Welsh government will be retaining responsibility for junior doctor recruitment. Northern Ireland is running its own inquiry, although it said it would review the Tooke findings.